Northern Expressions Needlework: Some finishes and a much needed vent! Some finishes and a much needed vent! Okay, I'll do the vent first and get it over with. Charting and instructions are sooooooo tedious. Sometimes I really wish I did more charts that were just cross stitch. It would save me ever so much time. I also wish I was a programmer and could come up with better and more efficient software. These are ridiculous. I have been stitching here and there, trying to put in an hour or two in the evenings, and I've managed a couple of finishes. Both, in their own way, were major PITA projects so I'm really glad to have them done and out of the way. A few weeks ago I finished Blackstone Fantasy Garden. Why was this a PITA you may ask? Only because my total silk snobbery has me so spoiled that working with cotton gives me nightmares. It feels awful to the touch, like twine!! Anyway, this was my last official work done in cotton. Nothing left to finish. A few kitted that I'll likely sell the kits for and re-kit in silk. 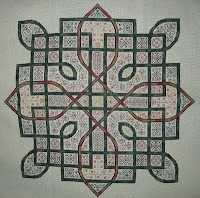 Also, it was done on 32 count lugana with 2 strands of thread. The only thing worse than cotton thread is multiple strands of cotton thread. 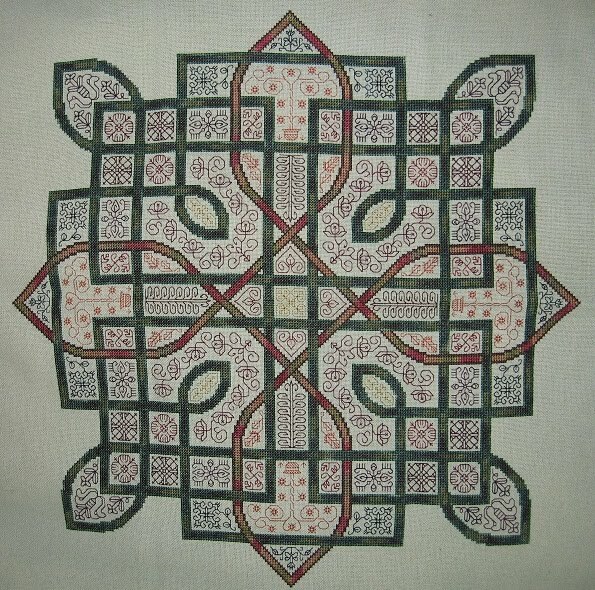 Anyway, the particulars - Blackstone Fantasy Garden is an Ink Circles design, and I stitched it in the suggested colours of Carrie's Creations floss, on 32 count Parkland Lugana from Silkweaver. I am happy with the finish, it is gorgeous, and Tracy's choice of colours is fantastic, I'm just glad to be done with it. Colours are pretty accurate in the picture. The other PITA I finished is Rosewood Manor's Quaker Diamonds. Again, a lovely design, looks gorgeous finished. This one WAS stitched in silk, so why the groaning? CONFETTI. One stitch here. One stitch there. 2 stitches here. 3 stitches there. I had 2 choices - change colours of thread every second stitch, or try to stitch all of one colour in an area and have to count and count like crazy to find where the next stitch was. And because of all the confetti, it was really easy to miss one stitch here or there and have to pull that colour out again anyway. GRRRRRRRR. It did finish up very nicely, I'm happy I stitched it, it will look pretty on my wall, and I'm even happier I finished it because it drove me to distraction. Particulars for this one - I wanted to stay fairly close to the original colours but there was absolutely no way I was using cotton. So I converted the colours to HDF. Some are from the BE line, some are random d-bag skeins. And of course, I stitched it on 40 count so I could use ONE strand. Thank god, confetti and mutiple strands, I'd have probably burned it before I was through the first page. The fabric is Sassy's French Vanilla and it's gorgeous fabric. Highly recommended. Again, colours came out pretty accurate in the picture. For anyone wondering, I only used about half a 5 yard skein of each colour. I had to put down EWS. I was working so much that it was hard to concentrate on something that intense, and white on white (or rather cream on cream) wasn't helping matters. Since finishing Quaker Diamonds last week (I think it was last week, days blur anymore - is it Saturday still?) I pulled out Alpine Seasons. Why oh why. More confetti, but at least this time I can be lazy if I want and carry floss behind because it's solid stitching. ;) I'm waiting for model threads for Forget Me Not and will start that when they get here. 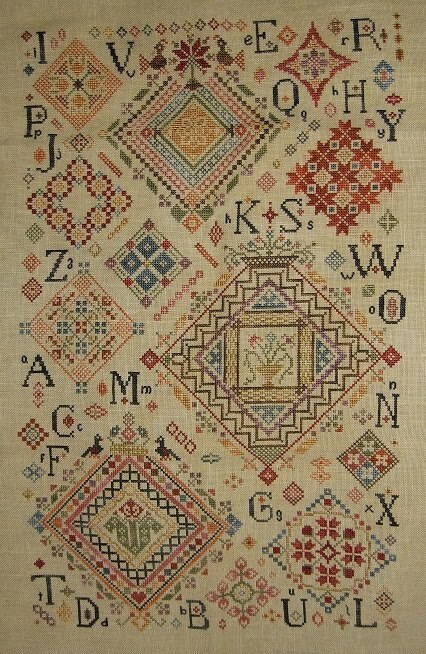 That one will be a breeze - it's all cross stitch. Congrats on your finishes! I know how that confetti stitching goes....I am working Quakers & Quilts right now but I bought Quaker Diamonds too so I'll probably do it someday. I converted to Belle Soie silks though for Q&Q - not only for the ease in stitching but I don't like railroading and I wanted it to be smaller in size. It costs too much to frame the large projects and they take up too much wallspace! I do still stitch occasional pieces with cotton floss though and I don't mind it. I'm pretty versatile. if i ever do stitch it i know now it has to be over two so i can do pin head starts and finishes for hte sngle stitches..
its weird the first two comments here are by a Jeanne and a Jeannie..